“A Village Remembered – Habousi” The Armenians of Habousi. Edited by Vatche Ghazarian. Description: Illustrated hardcover binding. 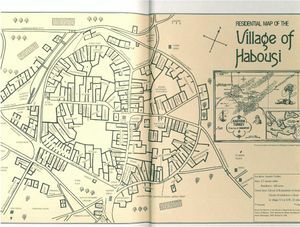 166 pages with map and many b/w illustrations. This book tells the story of the past and present of the Village Habousi in eastern Turkey, which was destroyed during the 1915 Genocide. The Armenians of the village were devastated during the violence, but those who survived have kept Habousi alive in their souls. They have remembered its beautiful scenery and brave, hardworking people. Their lives, customs, and traditions remain a valuable legacy for us all. The tales in this book will bring the village to life in your mind, and thus keep its inhabitants forever vibrant. 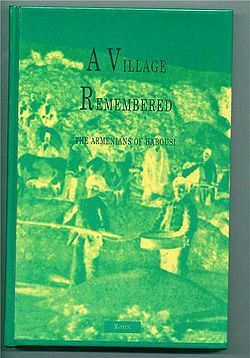 Facts about "A Village Remembered: The Armenians of Habousi"
This page was last edited on 19 April 2019, at 22:48.